Video games are art; this is a well-established fact at this point in time, in large thanks to my fellow game writers. Video games (usually) aim to contain visually pleasing elements combined with writing, music, character creation, art design, and even programming. Imagine how much more difficult it is for a game to be seen as a masterpiece by the general population when, instead of focusing on one or two elements, it must combine a half-dozen into a package that is widely accepted by consumers and critics alike. Now take that idea one step further: imagine the anguish those involved must feel while trying to create their pièce de résistance. The long days and longer sleepless nights blending together, family and friends getting pushed away, depression setting in alongside writer’s block or its equivalent… the work of an artist is never easy, even when the result is a bestselling video game. Layers of Fear is, in a way, a love letter to the game development process itself. Bloober Team was founded in 2008 and had six games under its belt in 2014 when it released Basement Crawl, what can only be described as an uber-flop of an action game for PlayStation 4 that has a whopping 27 (or “generally unfavourable”) on Metacritic. And how did the team recover? By releasing Layers of Fear, a first-person psychological horror game that left me quivering in terror under a blanket when I previewed it last year. The point of interest here is that the content of the game could easily mirror a struggling dev team: an artist who has seemingly lost everything is intent on completing his magnum opus, whatever that means. So does the artist succeed? I can’t very well just tell you, that would ruin everything. But what I can do is explore whether or not Bloober Team has created its own masterpiece with Layers of Fear. The main problem encountered when trying to define something as a masterpiece is that the word’s definition is about as vague as it gets. Merriam-Webster defines a masterpiece as “a work done with extraordinary skill; especially a supreme intellectual or artistic achievement” (emphasis is theirs). However, the term could also apply to an artist/intellect's best piece of work; for example, Salvidor Dali's masterpiece could be considered The Persistence of Memory as it is his most recognisable. The new problem that arises is that being well-known is only one aspect of what might make an artwork the creator’s absolute best. It is possible to consider financial, social, and artistic factors while determining what is or is not a masterpiece. As with any art form, the critiques can be widespread and disagreements will often arise. As such, I’ve created my own guide to how I could judge whether or not something (whether it be a video game, a song, a film, a photograph, a painting, a dance… you get the picture) is a masterpiece. Does it hold some value, whether it be financial, emotional, or social? Is it visually/audibly/mentally captivating and/or pleasing? Does it create discussion, or even disagreement? Can the person experiencing the work notice something new or surprising each time? Does it create emotion or stir up old memories? Okay, so it’s a pretty basic list. But we’re trying to cover a broad range of mediums, and darn if it isn’t difficult to find the correct terminology that would apply to every one. That is the blessing and the curse of the video game: it combines so many artistic categories into one multifaceted product, but trying to cover every one can be a curse if things don’t go well or the waters get muddy due to poor direction. 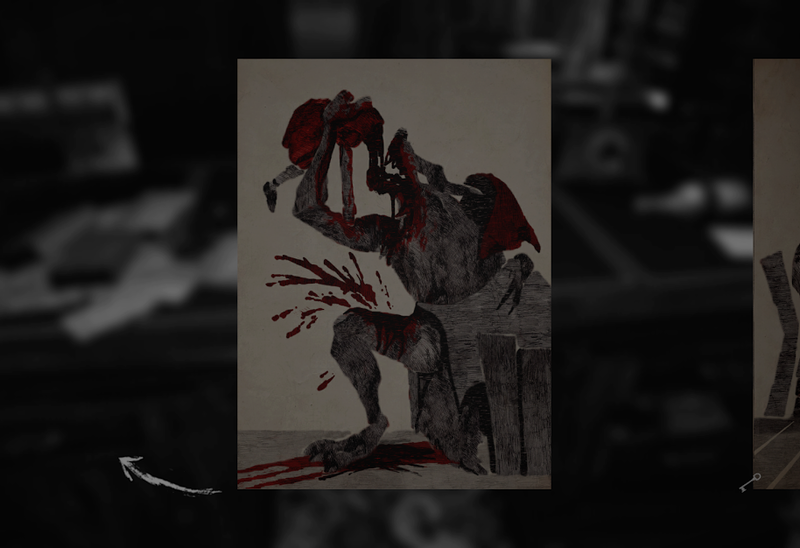 Is Layers of Fear Bloober Team’s masterpiece? I’ve read several reviews for Layers of Fear. Some complain that it is short, others that it is predictable. Many more love it for more reasons than I could even begin to list off. That’s wonderful, not because I agree or disagree with any one review but because there’s discussion at all regarding the game. It is very difficult to consider something a masterpiece if it’s never been acknowledged other than by the artist themselves. 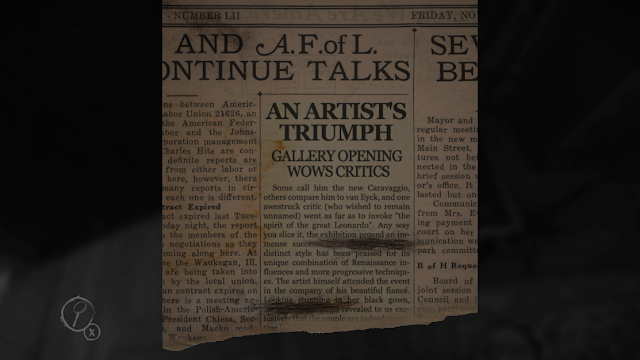 At the beginning of Layers of Fear, a quote by Oscar Wilde’s The Picture of Dorian Grey appears. “Every portrait that is painted with feeling is a portrait of the artist, not of the sitter.” Indeed, artists will often paint how they feel a scene looks like versus what it actually looks like. Canadian Group of Seven member A. Y. Jackson was known to take drastic measures, such as omit buildings or move trees, to portray a scene as he saw fit. Reality is subjective, as is everything it contains. The importance of Wilde’s quote weighed heavy on me as I ventured into the artist’s empty home. 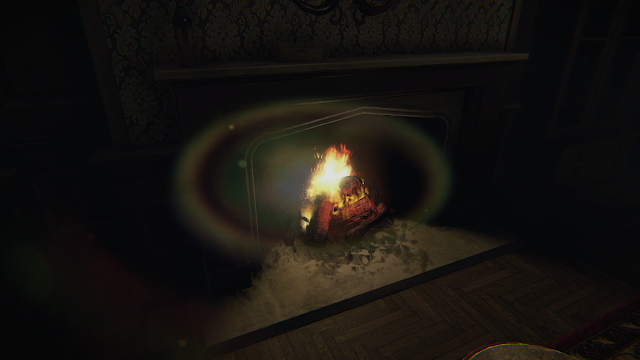 Layers of Fear is visually pleasing, without a doubt. It is as realistic as it needs to be, creating reasonable (albeit dark, since this is a horror game) lighting effects, depths, and textures. Where the team clearly spread its wings is when the psychological half of the game’s genre comes into play, as the artist experiences rooms that are almost psychedelic in nature. The surreal visions of the artist come to life with bold, bright swipes of neon paint accenting many surfaces. The house becomes a multicoloured crime scene when paint is streaked across the floor as though a person was painted every colour of the fluorescent rainbow before being dragged across the hall against their will. Something about the entire scenario makes me think of something from the Beatles’ drug-fueled years, although I can’t quite place my finger on what. It is not an understatement to say the game almost literally oozes emotion. The artist’s story is an emotional one that is pieced together as he explores his home, opening every drawer or cupboard along the way hoping for a few words to link him to his past. His past, like that of many artists, is tumultuous, although there was a time it was far more picturesque and serene. As the puzzle is solved, there is a rollercoaster of intense sadness, grief, anger… my brain was essentially that of the girl’s in Inside Out, with every emotion trying to take over the other to control my reaction. For another prominent emotion, look for further than the title: fear is what you will feel a good 50 per cent of the time (or more if you choose to leave no stone unturned). There is often the fear caused by things moving quickly and/or loudly. Look long enough at a rainy window and you'll begin to see things that aren't there. Or are they? (No, they're probably not. Unless they are.) This us comparable to different people seeing the same artwork: one person can see a smeary mess, but another person can stare at the same mess and see a face staring back at them. It’s also worth mentioning that the game successfully builds on fear instead of keeping it consistent, and the farther you go the more afraid you will feel simply because what happens next might be far worse than what has happened already. Believe it or not, there are many more layers to Layers of Fear (ha), as the game has multiple solutions/endings in addition to a ridiculous amount of artwork and paperwork to be discovered in each play through. When it comes to noticing something new upon each revisit, there is one specific and totally spoiler-free moment in the game that makes my heart skip a beat just thinking about it. It was my third time going through the game, and I thought there was nothing new to notice. I’m obsessive about searching, how much could I have missed? But at one point I was walking down a short hallway connecting two rooms. There was nothing surreal or scary. But the only sound was that of the artist’s feet on the ground which each step. Thump. Thump. Thump. My heart began beating at a similar rate, and by the time I was at my destination my body had decided danger was near solely because of the sound of steps. How fast I was going is obviously on me, but the perfectly clunky yet hollow sound of a boot on wood was able to evoke that emotion at that exact time. It was then I decided that this is it. This is Bloober Team’s masterpiece. This is what they were created to make. 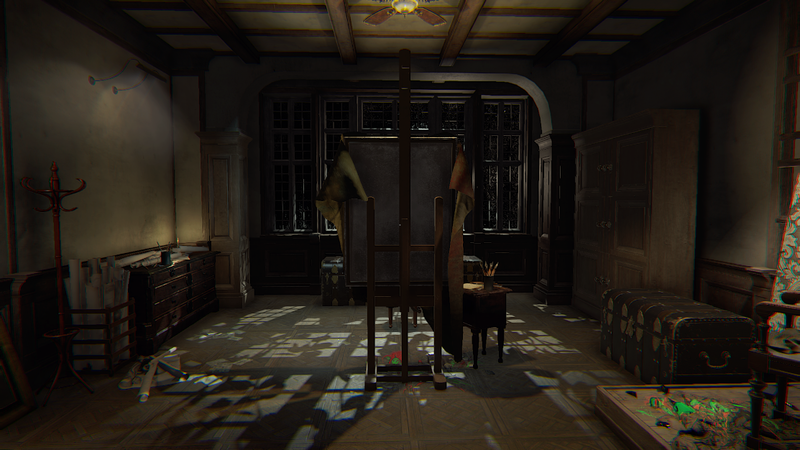 Layers of Fear is the completion of the artist’s quest to finish his own work, in a strange way. The similarities are stunning. Does it hold some value, whether it be financial, emotional, or social? Since it is for sale, the answer to the first part of the question is definitely yes (at least to some degree). Emotionally, Layers of Fear has provided me with psychological horror I have not seen since Eternal Darkness — and that means a lot. Is it visually/audibly/mentally captivating and/or pleasing? It’s an enthusiastic yes for this Unity-fueled game. It was realistic yet not realistic in a way reminiscent of surrealist paintings (Magritte comes to mind, especially his painting, The Human Condition). Does it create discussion, or even disagreement? I’m talking about it, aren’t I? Can the person experiencing the work notice something new or surprising each time? I’ve played several times over, and without a doubt the answer is yes. Not only are there multiple endings, but there are also small things to notice: whether it is a rat scurrying across the floor or the sound of a thunderclap, every detail counts. Does it create emotion or stir up old memories? Fear. Pure fear. The most primal of emotions is the overwhelming one while playing Layers of Fear.